Strideline Socks started way back in 2009 by Jake Director and Riley Goodman while they were both in high school – and boy have they come along way. Both athletes, playing both lacrosse and football, they saw that everyone was wearing either black, white, or grey crew socks. A big gap in the market appeared and so the story began. The boys set out to make athletic socks that weren’t just exciting but comfortable AF. It started with humble beginnings by printing city skylines on them. Let it be known they started the company with $500 from their high school graduation party. Being based out of Seattle they started with the Seattle skyline and expanded to different cities along the way. At first they used their parents garage for storage and would sell the socks out the back of their cars at random basketball, lacrosse, and football tournaments. Soon enough their city skyline socks caught the attention of a few retailers and were officially available on store shelves including Nordstrom, Macy’s, Champs, and Lids. While expanding, Strideline put a great amount of focus into quality. Experimenting with different padding, yarns, and materials; they wanted to make sure their customers were getting the best socks on the market. It was always one thing to make cool “looking” socks, but even more important to make sure they were the most comfortable socks on earth – something the fellas still live by today. Fast forward to 2017 and Strideline can now be found in over 2,000 doors nationwide while being worn by some of the best athletes on earth. Some of the biggest names wearing Strideline Socks include Marshawn Lynch, Antonio Brown, Odell Beckham Jr, CJ McCollum, Nate Robinson, and many more. They are also now licensed with ESPN, the NCAA, and MLS. 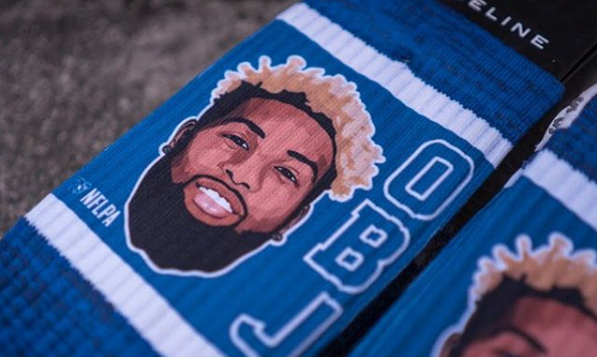 Strideline’s NFLPA range has some of the games biggest superstars, including OBJ. Their most recent endeavor is definitely one of the biggest moves the brand has made to date. They have officially partnered with the NFLPA. This allows Strideline to produce socks with every player in the NFL on them. All of their NFLPA styles can be found here. Players like Marshawn Lynch and Antonio Brown have even worn thier very own NFLPA socks in games this year. Some other big partnerships they’ve established recently are with Rick Ross and MMG, DJ Khaled and We The Best, 2 Chainz and his TRAP tour and IG’s Yeezy Busta. They legit are the most comfortable socks on earth – it’s not just something they say. We’d know, because they continue to make our own socks, too, and we’ve been an advocate for them ever since.